Breigarens Rico Er zijn geen producten in deze categorie. 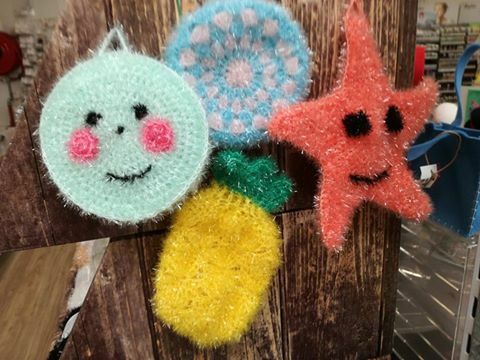 Thanks to our innovative yarn Creative Bubble, boring sponges are a thing of the past. The yarn was especially developed for knitting and crocheting individual sponges. The quality is complemented with two publications, which include various instructions for fancy sponges. The publication “funny” contains sponges with an Emoji designs and the publication „yummy“ contains instructions for various delicacies, such as melons or donuts. Creative Cotton Aran is een fantastische katoen wol die geschikt is voor het maken van decoratieve stukken zoals pannen lapjes en place matten. Een groot gamma aan kleuren staat ter uwer beschikking. The new yarn Rico Baby Dream - A Luxury Touch extends our range for Baby yarns. The softness of touch makes a lovely comfortable fabric. It comes in an irresistible palette of colours for girls and boys.The new yarn Rico Baby Dream - A Luxury Touch extends our range for Baby yarns. The softness of touch makes a lovely comfortable fabric. It comes in an irresistible palette of colours for girls and boys.